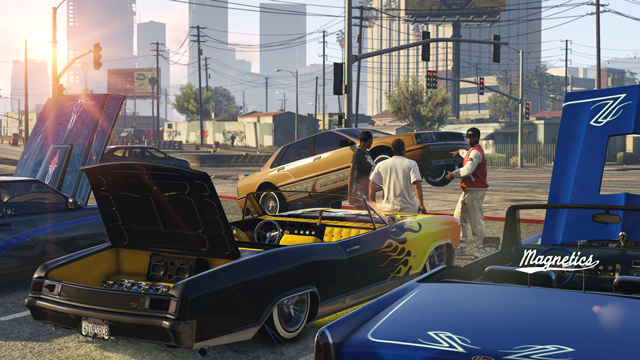 On Tuesday, October 20 Rockstar will release the GTA Online Lowriders Update for Grand Theft Auto V on PlayStation 4, Xbox One, and PC, but not PlayStation 3 or Xbox 360, as they explained last month. You can visit Benny’s website through the shortcut on your in-game phone and choose from six customizable vehicles, then bring them down to Benny for an upgrade that unlocks new custom lowrider modes. Deck out your engine block with covers and air filters, coat your interiors with velour, leather and patterns, choose custom colors and designs for your dials, or add a new steering wheel and custom shift levers. Give your ride lift with hydraulics – the more powerful the pumps, the higher you can bounce. And boost your stereo’s performance with new speakers and subs in the back. Using the Player Interaction Menu you’ll be able to show off your vehicle to others by opening up the doors, hood, and trunk, flashing your neons, and turning on the radio. Additionally, the Lowriders Update includes new missions from Lamar, the fully automatic Machine Pistol and Machete from Ammu-Nation, a fourth purchasable property, three new Adversary Modes, and new clothing, hair, and accessory options. Through October 19, Rockstar is holding a Grand Theft Auto sale on the North American PlayStation Store.